Product #16540 | SKU DWZM70 | 0.0 (no ratings yet) Thanks for your rating! 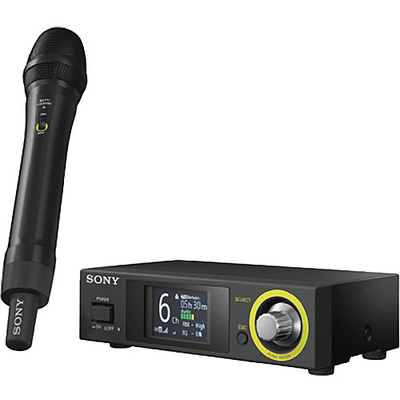 Sony DWZ System Demo The DWZ-M70 Digital Wireless Vocal/Speech Set from Sony includes a ZTX-M02RC handheld transmitter with interchangeable cardioid dynamic microphone capsule and a ZRX-M70 half-rack wireless receiver. It operates on a 2.4GHz ISM bandwidth and can be used for speech and other vocal performances in applications requiring a wireless setup. The ZRX-M70 half-rack wireless receiver features a built-in 5-band graphic AEQ and includes one XLR output and two 1/4" TS outputs. Its LCD display provides information on remaining transmitter battery life, diversity reception RF levels, audio metering, AEQ status, and channel selection. The set is capable of 24-bit Linear PCM quality digital audio and features AES 128-bit encryption as well as an intelligent feedback reducer.